The Regional Manager shall not . . . directly or indirectly solicit, entice, persuade or induce any individual who presently is, or at any time during such period shall be, an employee, sales associate or member of the company . . . to terminate or refrain from renewing or extending his or her employment, association or membership with the Company . . . or to become employed by or enter into a contractual relationship with Regional Manager or any business with which Regional Manager is affiliated. Prior to leaving and joining Nerium, another multi-level marketing company that sold skin care products, Cahill called a meeting of “Elite Leaders” (high performing associates of his) and let them know he was leaving. Although he did not mention by name the name of the new company, he mentioned that anyone who was interested should email him. After the meeting, he left. There was no allegation at this time that Cahill had access to any confidential associate or account information, but he did post information about his new company on several semi-private Pre-Paid Legal Facebook pages (pages Cahill had created to mentor his associates at Pre-Paid Legal). He did not post further to these pages, but he had been posting information about Nerium on his personal Facebook page. Trade secrets claim: As to Pre-Paid Legal’s trade secret claim, Cahill argued that he didn’t possess any trade secret information. Pre-Paid Legal made available to its supervisors various tools to analyze and track the progress of their associates, but Cahill declared unequivocally that after his departure from Pre-Paid Legal he did not have access to any of these tools. The meeting where he announced his intent to leave had occurred in the past, and the court says that it’s reluctant to issue an injunction where there is no evidence of ongoing conduct. Non-solicitation argument: The court in a footnote rejects Pre-Paid Legal’s argument that Cahill’s invitations to Pre-Paid Legal associates to join Twitter somehow violate the non-solicitation clause. The invitations were merely to join Twitter and at most, follow Cahill’s Twitter feed which did not contain information about either Pre-Paid Legal or Nerium. Employers understandably want to restrict the post-employment activities of their employees and prevent ex-employees from targeting customers and current employees. Although there have only been a few decisions in this arena, courts do not appear willing to restrict social interactions between ex-employees and customers or current employees. And this makes sense. Employers can probably restrict some additional activity around the edges (e.g., posting opportunities that are targeted at customers or employees) but this would probably require very precise contractual language. This would still not result in restricting informal interactions and networking between ex and current employees and customers. Eric’s Comment: This case is a microcosm of the shifting balance of power between employers and professional employees. Any employee can develop their own brand and audience in ways that eclipse the brand/audience of their employers. Interest in Cahill’s work and words extended beyond his relationship with his prior employer, so naturally his audience kept following him. As employers continue to invest in employees to help them aggregate audiences, only to recognize the portability of those audiences, it seems inevitable that employers will take ever-more-desperate efforts to prevent employee portability. It’s nice to see the courts rejecting these attempts. 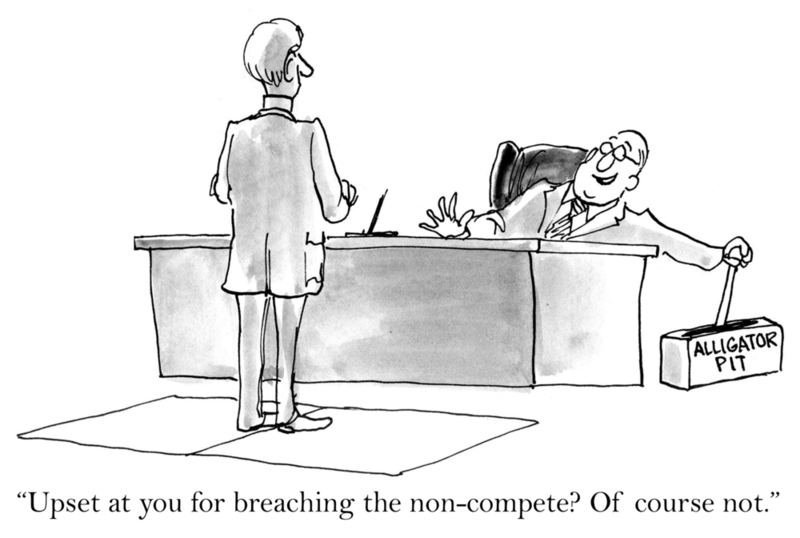 At the same time, anyone signing non-compete and non-solicitation clauses would be well-served to contemplate how those contract provisions might consider the potential for unwanted restrictions on audience development and management post-termination.